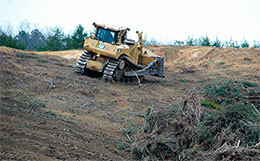 Crews were clearing brush at the Corbin site last spring. CORBIN, KY—SEPTEMBER 8, 2018—According to Gene McLean at "The Pressbox" multiple sources within the Kentucky Racing Commission have confirmed that the commission may begin reviewing applications for two new racing licenses with a goal of taking official action by the end of 2018. Previously the commission indicated it would not take action on the applications for new racing licenses submitted as part of a joint project by Keeneland and Churchill Down, which included a proposed Quarter Horse track in Corbin. "It is my understanding that this is part of the next step," said Corbin Industrial Development Director Bruce Carpenter. "I feel positive it is still moving forward." Cumberland Run, the track in Corbin, is planned on 149 acres of property off of the Corbin bypass between Allison and Buchanan Blvd. The Corbin Planning and Zoning Commission in October 2017 rezoned the property for public use. 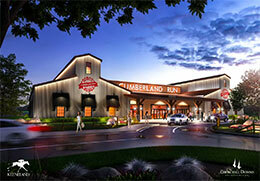 An architecture rendering of the proposed Corbin racetrack Cumberland Run. Vince Gabbert, vice president and chief operating officer of Keeneland, says securing the racing license is the last remaining hurdle. "As soon as we have that in hand, we will be ready to move forward," he said. Keeneland joined forces with Churchill Downs in September 2017 in the Corbin project and a second racing facility in Oak Grove in Christian County near Fort Campbell. According to Keeneland officials once construction begins, the plan is to have the facility ready and open for business within 14 months. The project includes a 1,723-foot straight racing track, along with barn facilities an entertainment center and grandstand. Gabbert said the goal remains to host 10-12 days of racing throughout the summer and the facility would include 250 "historical racing machines."